My father started going on week long canoe trips to Algonquin Provincial Park in Ontario, Canada with some friends from work. After a few years when my sister and I were old enough to go, he scheduled a trip with us. 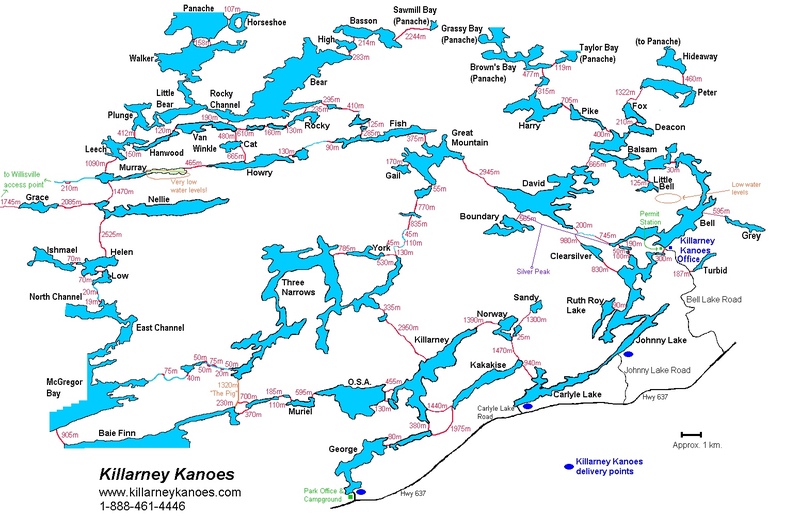 The year after, we scheduled another canoe trip in the lesser known Killarney Provincial Park. We were lucky that our father wanted to take us and he was probably lucky we wanted to go!! Dad had read about Killarney, but did not know anyone who had been there. I was about 16 and my sister about 12 years old. So off we went! We found there are two main types of portage campers. Ones that have a fast paced, defined route, which travel light, are up at daybreak, have a long route which is covered from dawn till dusk, usually eating easy to prepare meals or trail mixes along the way. The second group has a slower pace, a shorter route, which may stop at one place for a couple days, before moving on to the next, eating more eloborate meals, maybe fishing to add to the menu, maybe taking a nap or swim once in while; enjoying a campfire at night. We were classified in the second group! In 1969 backpacking and canoeing was maybe what we would call an extreme sport today. My first backpack was a used pack my father brought back from his time in the army during World War II, just 24 years previous. There was no REI, Bass Pro, or Cabbalas, but there was LL Bean. Tents didn’t have screens or floors. A cook kit was a combination of old pots and pans and WWII vintage utensils. Paddles were solid wood, not laminate. Sleeping bags were army surplus and mats were unheard of. The Boy Scouts offered more modern equipment with aluminum frame backpacks, civilian versions of cook kits, silverware sets, and waterproof match containers. At some point I gave up my army surplus sleeping bag for a more modern version made out of synthetic fabric instead of cotton and wool; a rectangular bag instead of a “mummy” bag. For food we repackaged macaroni and cheese, dehydrated scalloped or au gratin potatoes, dehydrated fruits, pancake mix, oatmeal, etc. and made our own “Gorp” (peanuts, raisins, and M&Ms). The first night we carried in fresh beef steak for our dinner. For preserved meat we brought Hickory Farms beef stick and double smoked bacon from a real butcher shop. Both these meats would keep for most of a week. We brought enough real eggs (about a dozen) for about the first 4 days of the trip or until they broke. For bread we brought a heavy seed rye bread. For cheese we brought a partial big block of Velveeta. For sweets we used small measured bottles of honey, real maple syrup, and a small amount of sugar. Knorr dehydrated soups or dehydrated bean soups made a nice addition. By today’s standards, bringing these types of food may seem like a lot of weight. For our type of relaxed camping, I am not sure we would change a lot, except for maybe some healthier substitutions and adding food packaging variations that were not available then. The goal was not to have any food left at the end of the trip!! So the packs got lighter every day! At the end of the week, we decided to drive down to Killarney. I believe it was Friday about noon. The village of Killarney is a small town on the shore of lake Huron and at that time there was a nearby silica mine. It was traditional to stop at a restaurant after we came out of the park at the end of a trip and have some “non-camp” food. No matter how great camp food is, after a week, anything else sounds better! After we finished lunch, Dad went out to start the car, but it would not start. At that time we would have had a used station wagon, either a Ford or maybe a Buick Special (at one time we had a used 1963 Buick Special Station wagon, which I believe was the first station wagon to have bucket seats in the front.) We asked around the small town if there was a garage, gas station or anyone who might be able to fix the car. We kept hearing about one guy who was pretty clever with cars that might be able to get it running. I can’t remember his name, let’s call him “Henry”. Henry worked at the silica mine and would come home on the afternoon ferry at about 5:30. So we patiently waited all afternoon. At about 5:30 PM we met Henry coming off the ferry and explained our situation. Henry pretty much dropped whatever plans he had for the next hour or so and completed a diagnostic on our car and got us back running again. Cars were simpler in those days. My Dad was pretty good at fixing things, but not this time. Henry had not really fixed the car, but he had figured out how to bypass the trouble. He installed a wire with an alligator clip at each end. when installed, it allowed you to start the car, but it would not turn off. To turn off the car, you had to stop the car, get out of the car, raise the hood and disconnect the alligator clip. I am sure my father paid Henry well for his time and we were on our way! I don’t remember exactly, but I am guessing we made a late night of it and drove all the way back home to East Aurora, NY, which would have been about 7 hours. I remember it being a wonderful trip with my father and sister, capped off by a little drama with the car, and probably really glad to get home and be back in my own comfortable bed.